Distributor / Channel Partner of a wide range of products which include photon max srt- floor polisher. 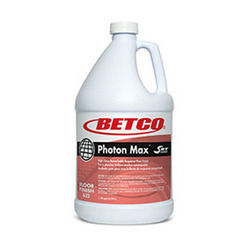 Our offered Photon Max Srt- Floor Polisher is formulated with scuff resistant technology (SRT) provides superior black heel mark resistance. It's excellent off the mop gloss, leveling properties and low odor qualities make this finish easy to apply. Dramatic gloss response when burnished.